Samsung has also upped its contrast game, giving the Q8F much richer blacks and cleaner whites comparable and perhaps better than the competition. Last year Samsung asked me to review their wonderful Q8C Curved QLED 4K TV. Now, we’re taking a look at their mid-tier offering for 2018, the Samsung Q8F QLED 4K UHD TV. Admittedly, last year’s review was my first TV review, so I’ve really learned a few things since then. I’m still far from being a huge TV nerd like a few of my colleagues, but I know what I like and what I expect. This Samsung Q8F QLED 4K UHD TV review is centered more around the family use of this television. Having five kids, four of them (ages 3-9) still at home, there is a variety of entertainment consumed on our TV. So, hopefully, those of you turning to this review will find our experience useful and insightful. We’ve added a variety of videos from Samsung to this review to help explain some of the technology. So without further delay, take a look at a long list of specs and read the full Samsung Q8F QLED 4K UHD TV review, winner of a Techaeris Top Pick for 2018. Ultra Black – Ultra Black Elite (Enhances contrast and preserves deep blacks and color richness in brighter room light settings. Connect Share – Plug your favorite entertainment and media into your TV – watch videos, play music, or view photos through a USB connection. 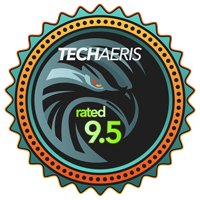 V-Chip – Allows parents to block inappropriate movies and programs based upon their FCC rating. The built-in Smart TV functions are spectacular. Last year I reviewed the curved Q8C and was totally stunned by its design. While I don’t believe the curved display really added anything to the viewing experience, it did give it an aesthetic appeal. Visitors often commented on the Q8C and how beautiful it looked. The Samsung Q8F QLED 4K UHD TV tosses the curve out the window in favor of a clean flat panel. The front of the TV is super clean and the lines are super sleek. The bezels are nearly invisible, so it’s really like looking at nothing but screen. As with most of Samsung’s mid and high-tier products, the materials here are pretty solid as well. The back of the TV is made from a sturdy plastic, I do prefer the brushed metal of the Q8C, but it’s still nice. There is VESA mounting which supports extending, pivoting, or tilting the TV. The Q8F is also Mini Wall Mount compatible should you want to go that route. The whole thing is super thin, which is basically where most TV OEM’s are going. The back of the TV does have I/O tucked in a small pocket. Unlike the Q8C and the higher end 2018 models, the Q8F does not come with a OneConnect box, which was disappointing. You will have to plug all of your cables into the back of the TV. Ports include – 4 HDMI ports (one of them being ARC), 2 USB ports, Ethernet port, RF, Optical Audio, and Power. 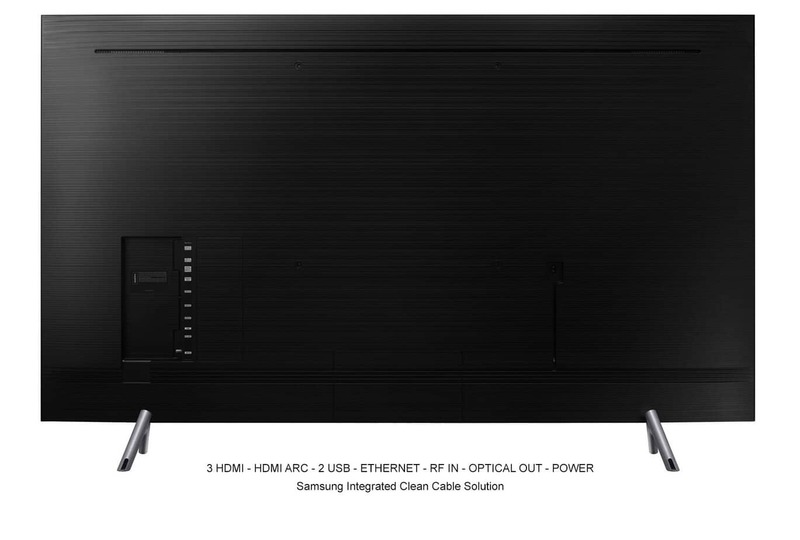 Samsung does provide some nice channels cut into the back of the TV to tuck your wires into. The included stand is also well built, made from a combination of plastics and metal. Overall, the design is nice, appealing, and fairly neutral. It’s not as aesthetically stunning as last years Q8C in terms of looks, but it still is a handsome TV. If you want a more creative aesthetic, Samsung’s higher range of 2018 QLED’s will offer that up. The Samsung Q8C was my first QLED experience as I really only ever purchased cheaper 1080p LED TVs from big box stores. After my Q8C review, there was quite a bit of reaction both in favor of and against QLED. Apparently, there is a large swath of users who prefer OLED TV technology and swear up and down by it. Now, I’ve seen OLED TVs in action but have never actually used one for any length of time. I admit, they look fantastic but, due to my limited interaction with them, I can’t really can’t comment very much. What I can say is, since using Samsung’s QLED TV technology, I’ve learned a whole lot more about QLED. What Samsung is doing with the tech is likely worrying some OLED TV makers. One of the things that some say is worrisome about OLED is burn-in. Have a look at Samsung’s video comparing their QLED to a competing OLED panel. QLED displays still use LCD technology, which is, basically, an LCD panel with LED backlighting. Samsung has added what they call Quantum Dot Technology over top of the panel along with a new anti-reflecting layer (see the next video). OLED displays are much thinner and use fewer layers to achieve their picture. This makes OLED TVs much thinner and for some, that is more aesthetically pleasing. OLED TVs are also known for quick response time which nearly eliminates motion-blur. OLED TVs have also been praised for really great blacks and superb viewing angles. Now that we have some of those OLED TV pros addressed, let’s talk about Samsung’s QLED technology and how it’s gotten better to the point of being on par with the best OLED TVs. Samsung’s QLED TVs are much brighter than OLED TVs. Now, that may not be a big deal to some who don’t watch TV in brightly lit rooms. Even though our living area is dimmed or dark, I still like the brightness tweaked up fairly high. Samsung’s QLED panels are able to retain their color vibrancy and contrast at brighter levels than are OLED TVs. This also helps Samsung deliver superb HDR picture quality with these panels. As we mentioned above, OLED TVs can suffer from screen burn-in, which will not happen with Samsung’s QLED technology. All this being said, the arguments against LCD panels that are used in QLED are viewing angles and black levels. Usually, QLED LCD panels don’t give you the deep blacks of an OLED TV, and the viewing angles aren’t as spot on. With Samsung’s new 2018 lineup, the company has tackled a lot of the issues some people have with QLED LCD panels. This Samsung Q8F QLED 4K UHD TV has full array backlight control with an anti-glare coating on the screen which helps immensely with viewing angles. Samsung also has Q Color technology in their flagship QLED TV’s which they say “pushes the boundaries of color” with their Quantum Dot technology. That’s over a billion shades and 100% color volume**. This Samsung Q8F QLED 4K UHD TV has full array backlight control with an anti-glare coating on the screen that helps immensely with viewing angles. Samsung has also upped its contrast game giving the Q8F much richer blacks and cleaner whites comparable and perhaps better than the competition. Their contrast technology is dubbed Q Contrast Elite and it smartly controls zones of full array LEDs that adjust automatically and work alongside the anti-reflective screen. That anti-reflective screen is called, Ultra Black Elite and I will say that the viewing angles on the Q8F are simply amazing. Colors, blacks, and whites all look crisp from any angle. HDR 10+: An advanced HDR technology, HDR 10+ precisely optimizes every scene for color, contrast, and details. 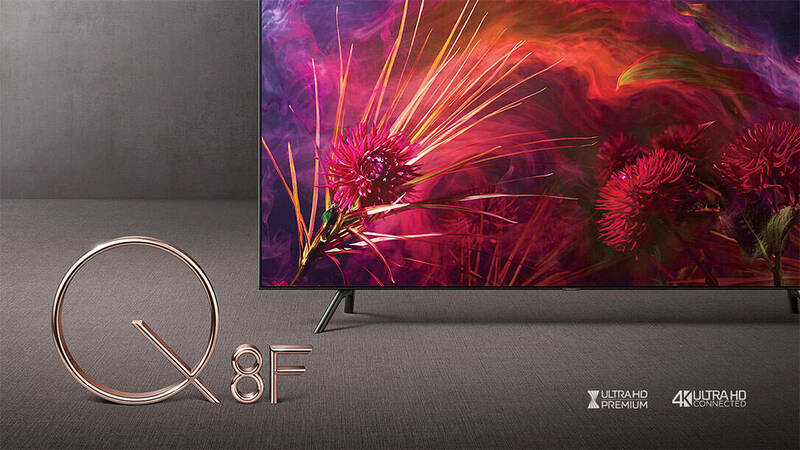 UltraHD Premium: QLED Q8F TVs are certified as Ultra HD Premium to deliver 4K clarity with exceptional HDR performance and more expansive color for a cinematic viewing experience as the director intended. 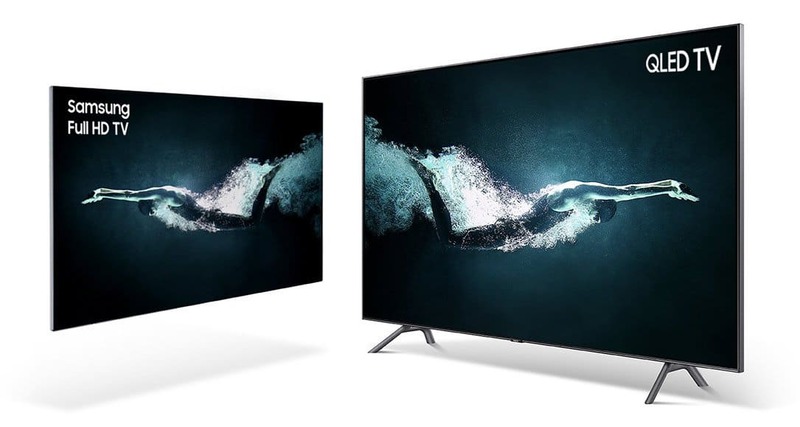 4K UltraHD Connected: QLED TVs meet the highest 4K Ultra High-Definition standards as defined by the Consumer Electronics Association (CEA). Like the Q8C from last year, the Samsung Q8F QLED 4K UHD TV has a variety of presets and granular picture adjustments. You can stick with the supplied presets or jump in deeper and adjust them to your preferences. Dynamic Mode offers up a brighter, more vibrant overall picture. It was a bit much for my taste and far too bright. Standard Mode gives a more balanced overall look and feel, and it’s a tad less bright. Natural Mode is a more subtle and organic color and brightness and is the mode we chose to use for everything. Movie Mode pulls the brightness back significantly and sort of brings a yellowish tint to the screen. Samsung’s ECO Sensor technology is also back. This senses the light in the room and will dim or brighten the panel accordingly. It’s not a feature I like, as I don’t mind the screen at a good brightness in a dark room. But, I do think it’s a handy feature that many will find very useful and it works brilliantly. It’s also great for energy savings and probably better for your eyes than leaving it at high brightness like I do. Once you have your color preferences, contrast, brightness, and settings all squared away…the display is absolutely stunning. Having now experienced 4K UHD content on the Samsung Q8F, watching content on 1080p TVs is not quite the same. Samsung’s Q8C from 2017 was brilliant in so many ways and I believe Samsung topped that set in spades. The Q8F isn’t even the top of the line for 2018. Colors are vibrant, even more so than last years model I reviewed, and they just pop off the display. Blacks are rich and deep with whites keeping their clean and crisp look. As I said in the past, the 4K content on these displays is so lifelike it’s almost as if you can touch what you’re seeing. Watching 4K content on Netflix and Vudu is simply amazing. I especially recommend documentaries like Planet Earth 2 and some of Netflix Original 4K series. We watched the first season of Lost In Space, and I couldn’t believe the scenes in the caves and other dark places. On my 1080p Samsung, watching the same show, you could plainly see the black areas were more gray and banded. On the other hand, the Q8F picture was just like ink, there was no visible banding or graying. Whatever Samsung is doing with QLED, it’s going in the right direction. Now that I have a taste for 4K content, I try and get as much of it as I can. Of course, it’s impossible to get everything in 4K, so we do consume a lot of 1080p content on the Q8F. Playback of 1080p content is also very vibrant and clean, I’ll almost say that even some of the clarity and detail from 4K can be seen here. It’s not as great but still fantastic. Watching older YouTube videos in 720p was also not bad, but getting into 480p was, well, not great. But that’s to be expected as it is 480p on a 65″ TV. My wife is fond of the older sitcoms like Frazier, Cheers, and Friends. Some of the episodes just look horrible. This is not the TV’s fault, they just look bad in the format and resolution they were filmed in. I have to say, Samsung’s QLED TVs have turned me off to the old classics I used to enjoy, but that’s not a bad thing. Overall, I think Samsung has improved the QLED display technology here. I felt that the colors popped ever so slightly more than last years models. The blacks were certainly much deeper and sleeker. The whites were clean and crisp. Viewing angles and glare were significantly cut down and the whole viewing experience was just overall fantastic. I don’t think anyone will have a problem with the Samsung Q8F QLED 4K UHD TV display. As with the Q8C last year, the Samsung Q8F QLED 4K UHD TV will take at least two people to assemble and put in place. Samsung provides some nice sticky pads on the display that allow you to get a good grip when lifting it. I would not attempt to take this out of its box without assistance. Consider the price you paid, it’s not worth breaking it before you even get it set up. Once you have it out of the box, the legs just snap into place and do have labels indicating left and right. Once you have the TV out of the box and either your stand or a VESA mount installed, I would think about running your cables and wires to the back before actually putting it into place. Samsung provides what they call a “Clean Cable Solution” on the back of the Q8F. There are grooves along the back of the TV in which you can tuck your cables and route them through the TV stand leg. This makes for a nice tidy look. The Samsung Clean Cable Solution neatly manages cords for a crisp, clean look. It only takes three simple steps. Step 1. Plug in your cables. Step 2. Push your cables into the embedded cable lines on the back. Step 3. Neatly organize your cables through the TV stand. Once you have the TV all set in its physical location and connections are made, it’s time to set up the viewing experience. Before I forget, I do want to mention that the Q8F does not have the OneConnect box, and that is something I missed as it really helped to keep cables and external devices cleaned up. Samsung has made improvements to the new OneConnect box, which I wish I would have had the chance to experience. Now back to set up. You have two options for setup: the remote control navigation or the smartphone app. Since I have a Samsung Galaxy S8+, I opted to use the Samsung SmartThings app to set the TV up. Using the remote to navigate the interface for setup is very easy, and you do not need the SmartThings app to set up the TV properly. The SmartThings app is available on both Android and iOS. You do not need a Samsung phone to use it. Once you power the TV on you’ll be asked if you want to use your smartphone for setup or continue on with remote control setup. Both setup processes are nearly identical except the app connects to your TV and any other supported device, giving you the option to control all of them from your phone. The SmartThings app is really useful for users who have multiple Samsung devices and supported smart home gadgets. It helps eliminate some remote control clutter if that’s something you’re looking to clean up. Setting up the TV is extremely easy, especially if you’re opting not to use the Smart portion of the TV. Some may simply be using an Apple TV, Roku, Chromecast, or other device and skip right over the Samsung’s Smart Hub…but I suggest you don’t. More on the Samsung Smart Hub in the software section, but getting through the setup of the Smart Hub is simple. All of Samsung’s menus for basic picture and sound settings are pretty straightforward and easy to use. Getting Smart Hub and apps to work is also painless, although you will have to log back into your accounts. Although, if you have a Samsung account and have saved passwords to apps there, it should log you in automatically. Here are the steps for setting up the TV with your phone. Turn on your TV. Your smartphone and TV will connect automatically, taking you to the next step to set-up your new QLED TV. Your smartphone will share Wi-Fi network information with your TV. If your smartphone is linked to a Samsung Account, it will automatically be shared with your TV. No separate login required. Choose the apps on your smartphone that you also want on your TV. They’ll be copied into your TV’s Smart Hub and you’ll automatically be logged in. The Samsung SmartThings app is super useful for those who have devices that can be controlled through the app. Overall, setup is super simple. Be aware that this is a two-person job. 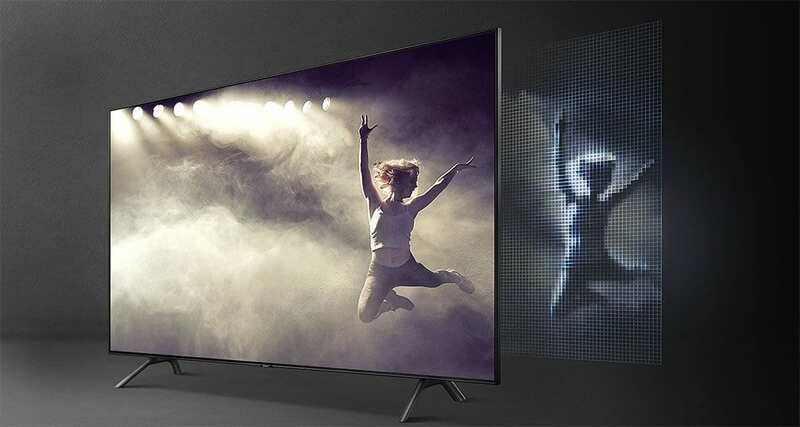 While the Samsung Q8F QLED 4K UHD TV is thin and not extremely heavy, its awkward and large shape makes it difficult to handle for one person. Take precautions before unpacking to be sure you’re not only being safe, but you don’t damage the TV physically. Setting up the TV interface is also super easy. The guided remote or SmartThings app UI is very easy to follow and you’ll be up and running in no time. Alright, before we talk Samsung Smart Hub just know that you do not have to use the smart features of this TV. You can simply plug in your Xbox One, PlayStation, Apple TV, or any other device you want, and you’re good to go. However, I really enjoy the Samsung Smart Hub and have actually retired my Xbox One to just gaming. Previously, before Smart Hub, I used my Xbox One for all of my streaming. Now, we do it all on the Samsung Q8F. Including, YouTube TV, Netflix, Plex, Amazon Prime Video, YouTube, Vudu, YouTube Kids, Amazon Prime Music, Google Play Movies, and Google Play Music. Like every other company out there, Samsung wants to make themselves the center of your electronic life. 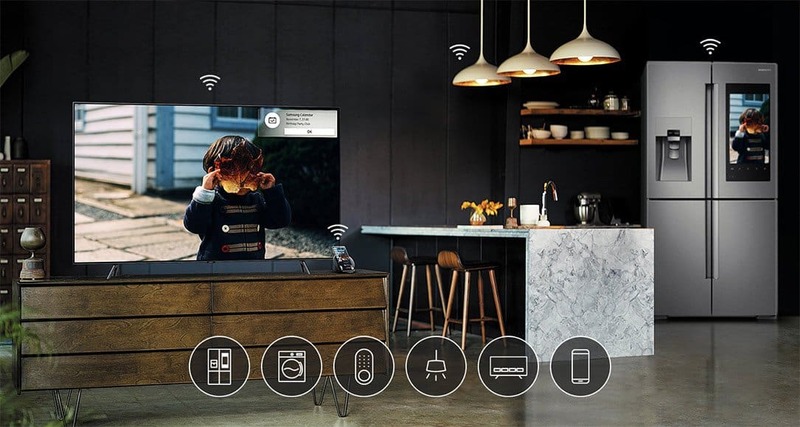 With Smart Hub, you can share photos, videos, and music through your home wireless network to the Q8C using a compatible device. This is very similar to what Apple TV does with iOS devices. 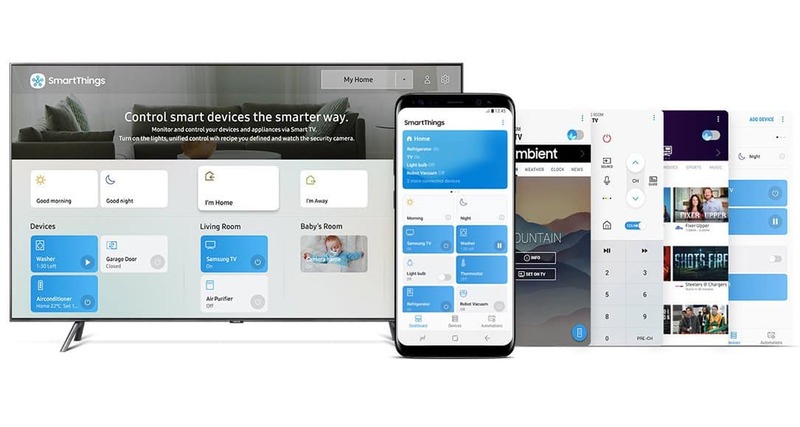 The ‘Smart Hub’ interface has been extended to smartphones through Samsung’s new and improved ‘Smart View’ app, which now provides a comprehensive overview of all available content on the app’s home screen. Thus, consumers can use their mobile device to select and start their favorite live TV programs and video-on-demand services – on their TV, through the ‘Smart View’ mobile app. Consumers can also choose to receive alerts on their mobile devices about their favorite content, regarding for example, show times and availability. Here is a short list of what apps and services you can expect to find on Samsung’s Smart Hub interface. It is important to note that some apps may require a login or account from the app developer. Some content can be had for free without a login, but it is limited. Universal Guide brings your favorite content from multiple devices and apps together in an easy-to-browse menu. 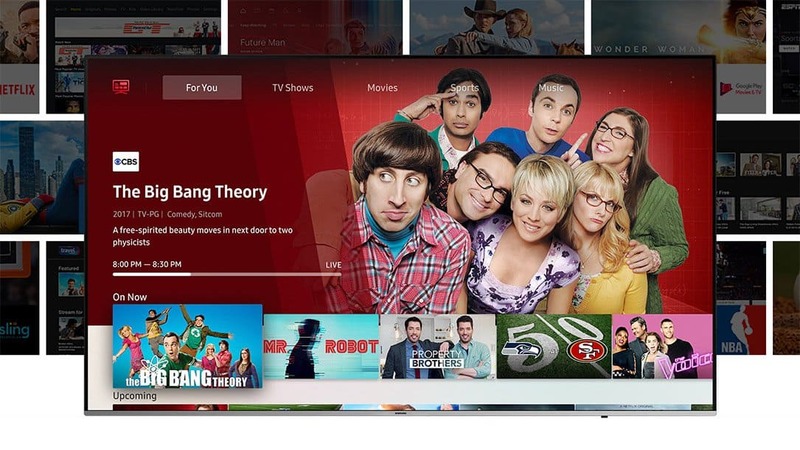 It recommends popular shows and can even make custom recommendations tailored just for you. When I first reviewed the Q8C, I was hesitant to use the Smart Hub, but I felt I needed to use it for that review. After using it for a few months, I found I enjoyed it a lot, and my wife greatly appreciated only having to use one remote. When the Samsung Q8F arrived, I was ready and willing to jump into the Smart Hub again. The entire user interface is clean and aesthetically pleasing. Everything is nicely laid out and easy to find, and you can pin your favorite apps to the home screen. The Samsung Q8F QLED 4K UHD TV’s smart features can easily replace any device you own, except for gaming. And that’s okay. Since Samsung is the official 4K TV of the Xbox One the Q8F pairs very well with your Xbox and, if you have the One X, you’ll get the 4K gaming experience. New in 2018 is the addition of Bixby. Samsung has been pushing their digital assistant this year and they’re hoping you’ll use Bixby on the TV. I tested Bixby extensively and, honestly, it’s pretty helpful. It’s not unlike Google Assistant or Siri and can find apps, information, and other tidbits for you quickly without having to poke around menus. Bixby isn’t going to appeal to everyone, but I do highly suggest you at least give it a try. Also new in 2018 is Ambient Mode. Ambient Mode allows you to leave your Samsung Q8F QLED 4K UHD TV in a sort of sleep mode. 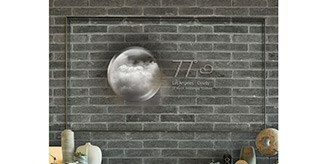 This means the TV will consume low power but still give you useful information on the screen like weather or news. You can also use it as a picture frame for photos or even mimic the background the TV is mounted on. You can do this by using your phone to match the background. Overall, the software experience is really one of the best I’ve seen on any smart TV. My 1080p Samsung model still has the old Samsung SmartTV interface, which is really lacking. Thankfully, Samsung has made major improvements to these new TVs and I have no problem recommending you use the Smart Hub. I’m still no fan of built-in TV speakers. TV speakers are usually tinny, thin, lack any bass response, and are basically useless for any sort of gaming or movie entertainment. I typically use a soundbar or surround sound system to give me better sound. I rarely have anything nice to say about TV speakers, but last year that changed with the Q8C. Now, the Q8F joins last year’s Q8C with some pretty damn good sound. I was shocked at the sound I heard coming from these Samsung TVs. The soundstage is broad, and there is some actual bass response coming from these things. While I do think you will highly benefit by adding a soundbar to the Q8F, it’s not a necessity right off the bat if you need to save some money for one. Something that would work well is the Samsung MS750 or a cheaper, but still powerful performer, the Samsung N400. We’ll have a full review of the N400 in the coming weeks. Spoiler, it’s great. Overall, the sound quality on the Samsung Q8F QLED 4K UHD TV is certainly better than your basic TV. It will get most users through their basic needs, but if you’re wanting an immersive soundstage, well, I would suggest you invest in a soundbar. But it’s nice that the onboard speakers should get most through until they can afford that soundbar. The Samsung Q8F QLED 4K UHD TV was a solid performer. Through daily use, it had no issues streaming movies and TV shows in 1080p or 4K HDR. I opted to connect ethernet directly to the TV rather than using Wi-Fi, but that didn’t really show any boosted performance. Given that I have Gigabit speeds, I didn’t expect to see a huge performance gain. For those of you with slower Wi-Fi connections, using ethernet should help with streaming. Playback on the Samsung UBD-M9500 Blu-Ray player was equally smooth and flawless. Playback on devices like the Apple TV, Chromecast, and Amazon Fire Stick were all equally great. Video quality overall was what I would consider superior performance. Gaming on the Q8F, especially with the Xbox One X, was the best home gaming experience I’ve had, next to the Q8C from last year. Colors are vibrant throughout games like Assassin’s Creed Origins, Destiny 2, and Forza 7. The level of detail in the imagery in these games is stunning, and motion blur is nearly non-existent. I do not have a PlayStation to test with, but I am sure the gaming experience is about the same. 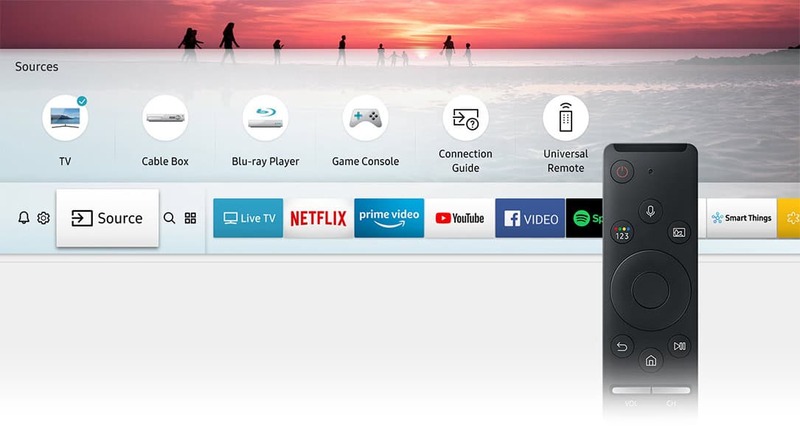 The Samsung OneRemote is back, but not the same silver aluminum version that the Q8C had. The Q8F has a black plastic OneRemote that has the same functionality but isn’t as aesthetically pleasing or as nice to hold. There is the addition of the Bixby button and the Ambient Mode button for 2018. You can also opt to use the Samsung SmartThings App to control your TV and other devices. The nice thing about the OneRemote is that it will control other compatible devices connected to the Q8F, so I can control selection on my Xbox One X using the remote. Of course, you can’t actually play games with the remote, but you can navigate the interface. Overall, the Q8F performed outstandingly well. It showcases 1080p programming very well and 4K HDR content is simply stunning on this panel. Gaming with the Xbox One X in 4K HDR is an absolute pleasure, and it makes you appreciate the effort gaming developers put into their games. I do not think anyone will be disappointed by the color, contrast, blacks, and overall crispness of this television. Samsung’s Full HD compared to their QLED TV. The Samsung Q8F QLED 4K UHD TV isn’t the company’s highest-end television and is priced at $2,999.99USD. As of this review, Samsung does have a sale going on for $2,799.99USD. You could save $2USD by getting it through Amazon. Yes, this is a high price, but this isn’t your average class TV. Samsung’s QLED lineup is competing against the likes of LG’s best OLED lineup, which are similarly priced. Yes, this is an expensive purchase but there is a lot of value here, especially if you’re not one to go to the movies very often. The money you spend on movie tickets, popcorn, and snacks adds up quick, so buying a TV of this caliber and staying home to watch eventually pays for itself. The picture quality is amazing, especially the 4K HDR, and 1080p playback is equally impressive. The Samsung software package is really great and can really replace some users’ Rokus, Amazon TVs, Apple TVs, and other boxes. I think there’s a lot of value here for those who are looking at TVs in this category. Some may not be able to see past the price tag, but then that likely means they were never going to consider this TV anyway. Overall, I think there’s a ton of value for the money in Samsung’s QLED lineup. Now, it’s just a matter of asking yourself if that value is worth YOUR money. Without a doubt, the Samsung Q8F QLED 4K UHD TV is pricey, even though it’s not their flagship. If you’ve reached the end of this review, then you’re probably the person who is considering dropping the cash for this type of investment. In the end, it is an investment. Samsung knows this and that’s why they make these QLED TVs with great care and precision. I really think this television will last for years to come, and as 4K content starts becoming more available, you’ll be 100% ready for it. Nearly $3,000USD is hard to swallow, but Samsung does offer its own financing should you want to go that route. The Q8F is a solid choice for a 4K UHD TV, and QLED technology is pretty much on par with OLED now. Blacks are deeper, colors are punchy, whites are crisp, brightness is amazing without washing out colors. 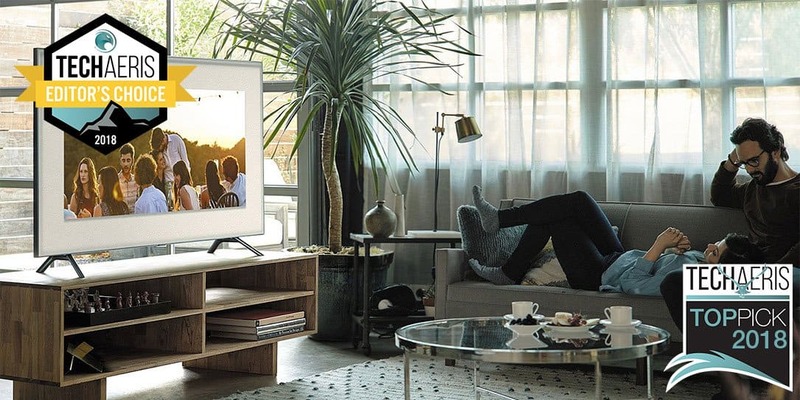 There’s a lot to like about this TV but you should also take a look at the Samsung Q9F which offers up the OneConnect box, which I think is worth the price of admission. At the end of the day, we can talk specs, colors, contrast, QLED vs OLED all day long. What matters is how these TVs look…and having tested this one for the past few months, I can say that it’s well worth your time. Now you have to decide if the Samsung Q8F QLED 4K UHD TV is worth your money. * We received a review unit of the Samsung Q8F QLED 4K UHD for the purposes of this review. **Samsung QLED is a Quantum Dot based TV. QLED televisions can produce 100% color volume in the DCI-P3 color space, the format for most cinema screen and HDR movies for television.